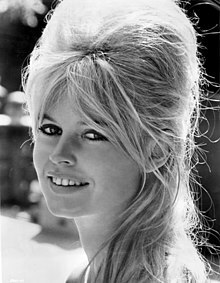 Brigitte Anne-Marie Bardot (French: [bʁiʒit baʁˈdo]; born 28 September 1934) is a French actress, sangster an fashion model, wha later acame an ainimal richts activist. ↑ "Films and Music by Brigitte Bardot". Rate Your Music. Retrieved 13 March 2010. ↑ "Daily Celebrations ~ Brigitte Bardot, Cat Transformed". Dailycelebrations.com. Retrieved 13 March 2010. This page wis last eeditit on 2 September 2018, at 17:15.